The Food Network’s Aaron McCargo, Jr spices up meals for patients with serious kidney problems. Several conditions can cause the loss of kidney function. The most common is type 2 diabetes, but cardiovascular disease can also be a cause. Sometimes old age is the culprit. Other times, genetic factors, such as polycystic kidney disease, are to blame. Whatever the underlying reason may be, once kidney function deteriorates to the point where the kidneys can no longer remove enough toxins from a person’s blood to keep him or her healthy—a condition known as end-stage renal disease (ESRD)—the person must start dialysis. The United States Renal Data System estimates that 382,000 patients with ESRD are currently receiving some form of dialysis. Dialysis does the work that the kidneys can no longer perform. Unless a patient receives a kidney transplant, he or she will stay on dialysis indefinitely. Because patients who are on dialysis need to restrict certain dietary nutrients to maintain their health, renal diets can be incredibly challenging for patients and dietitians alike. To complicate matters, many dialysis patients have food restrictions related to other health problems. Trying to sort through multiple diets can quickly become a daunting task. Barbara L. Zebrowski, MS, RD, CSR, LDN, corporate dietitian for Fresenius Medical Care North America (FMCNA), which operates more than 1,800 dialysis centers in the United States, says patients are often overwhelmed by all the diet strictures. For this reason, finding ways to stick to the diet without robbing it of flavor is a critical concern but easier said than done. To begin, because it causes increased thirst and fluid retention in patients, salt needs to be eliminated from renal diets to the greatest extent possible. Foods that contain phosphates, such as nuts, beans, dairy products, and colas, are also problematic. An excess amount of phosphates in the blood can affect bone and heart health, particularly for people who rely on dialysis. Adding to the difficulty, many food manufacturers add phosphates to their products. In addition, patients on hemodialysis—the mechanical cleansing of the blood using an external filter—need to restrict foods that contain potassium. Too much potassium can cause cardiac arrest in patients on hemodialysis. Foods such as oranges, tomatoes, and bananas are high in potassium. Patients also need to eat about 1.5 times the amount of protein that a person without diet restrictions would need as well as additional calories. Zebrowski says rather than eating three big meals, patients are encouraged to eat several smaller meals during the course of the day. Lean cuts of meat are preferred because excess fat can lead to cardiovascular disease, the No. 1 killer of patients on dialysis. To help meet protein needs, dietary supplements are often prescribed. For vegetarian patients, supplements are almost always necessary. Zebrowski says planning a renal diet for a vegetarian patient isn’t easy, but it can be done. One of the difficulties lies in the bean restriction; many vegetarians meet their protein needs by eating a variety of beans. Zebrowski says research suggests that beans may not be as problematic as they were once thought to be as long as they’re not overused. One reason for increased protein intake is to maintain albumin levels in the blood, because protein contributes to albumin production. Higher albumin levels are associated with fewer hospitalizations and a lower risk of death. Although albumin levels are also influenced by nonnutritional factors, such as a wound or dental periodontitis, Zebrowski says nutrition needs to be addressed to meet these peripheral needs as well. Unfortunately, dialysis patients often experience decreased appetite and lose their taste for meat. To help patients find more appealing food options, FMCNA partnered with Chef Aaron McCargo, Jr, star of Big Daddy’s House on the Food Network, to develop some taste bud-friendly recipes suitable for renal diets. McCargo has seen up close the struggles of maintaining a renal diet. One of his best friends and his pastor are both on renal diets. McCargo decided to use his cooking skills to help them enjoy eating again. McCargo is known for cooking with bold flavors. Working with FMCNA dietitians, he developed recipes that meet renal diet standards without sacrificing taste. The recipes McCargo created include Crunchy Lemon Herbed Chicken, Sautéed Beef With Creamy Mushroom and Shallot Sauce, and Chicken Tacos. He says the key to cooking these dishes is to make flavorful substitutions for common ingredients. McCargo often uses black pepper, red pepper flakes, cumin, chili powder, garlic and onion (both granulated), dried oregano, smoked paprika, fresh cilantro, fresh basil, fresh scallions, fresh lemon and lime zest, and rosemary in his own cooking. He likes the versatility these herbs and spices allow. They can easily be combined to make marinades, rubs, or dips, which add flavor without disrupting a healthful diet. However, for people who don’t spend much time in the kitchen, a spice rack may not be much more useful than a chemistry set when it’s time to make dinner. McCargo says there’s nothing to fear. The only hard and fast rules he follows are “everything in moderation” and “only serve food you want to eat.” He says different cultures and ethnic groups have different ideas about which herbs and spices work well together, but he tries to avoid putting two powerful flavors in the same dish. Instead, he likes to mix a potent herb or spice, such as dill, basil, tarragon, rosemary, or fennel—”all fresh, of course”—with a lighter one, such as parsley, chervil, or marjoram. McCargo prefers to go lighter on earthy, winter- and fall-type spices, such as cinnamon, cloves, nutmeg, and allspice, as well as summer-type spices, such as curry, anise, dry dill, and dried tarragon. These spices have the potential to become overpowering in a dish, but McCargo says personal preference is the ultimate guide. With a little trial and error, even a novice can create healthful, tasty meals. “Pick and choose the combination that works best for the dish by using smaller amounts of the summer and winter spices, since they tend to be more pungent in flavor, and offset them with the list of my basic favorites to make sure that all the spices and herbs get a fair play on the plate,” says McCargo. Zebrowski says it’s extremely important to speak with patients about their food preferences to get a better idea of how they are coping; lab values tell only part of the story. Dietitians should ask patients which foods they miss most and try to find ways to incorporate these foods into the diet. The goal is to be as nonrestrictive as possible. “We need to be listening about their appetite and about what it is that they’re missing from their food that they’ve always liked and enjoyed that perhaps we can work back into their meal plans, perhaps in smaller quantities and perhaps less frequently, but it’s there so that people can continue to have satisfying meals,” she says. It’s also important to ask patients about their energy levels. Many patients don’t want to cook following dialysis. One way they can work around this is to make meals that will taste good as leftovers or can be easily reworked into another dish. Recipes that don’t require much preparation are helpful as well. McCargo designed his recipes with simplicity in mind. To show patients and their families how to cook his Crunchy Lemon Herbed Chicken, he recorded a cooking demonstration that is available on FMCNA’s website. It has generated a great deal of positive feedback. “That gave our dietitians a tool to use with the patients to show them that they can still cook, they can still enjoy their food, and we can work into their meal plans the foods that will make them happy to be alive,” says Zebrowski. Another tool for patient education that FMCNA has developed is its website. In addition to patients with kidney failure, the site is also intended for people who have reduced kidney function. Zebrowski says it’s important for people to get their kidney function checked before they need dialysis because early intervention may postpone dialysis. Other videos on the site deal with a range of topics. One video focuses on grocery shopping and avoiding phosphate additives in everyday foods while finding alternatives that don’t contain phosphates. Another underscores the importance of protein in albumin production. Another discusses phosphorus control. 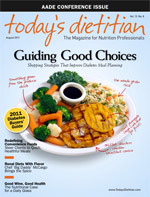 In addition, FMCNA dietitians have developed other tools for patients and their families. A patient report card helps patients understand their lab values and which nutrition adjustments they need to make to maintain health. FMCNA dietitians have also developed numerous handouts and bulletin boards over the past five years. The goal of all these tools is to provide patients and their families with as much information as possible to improve patients’ quality of life. Starting dialysis can be overwhelming, and the associated food restrictions can be especially difficult to understand as well as implement. Educating patients and their families is one of the best ways dietitians can help dialysis patients adjust. Zebrowski says dietitians should also listen closely to what their patients tell them to better assist them in maintaining their quality of life. 1. Be creative. Look for recipes that make good leftovers. For example, leftover beef tacos can be used in a quesadilla, chili (without tomatoes), or a lettuce wrap. 2. Look for lower-cost items. Many patients don’t have a lot of money, so stretching a budget is important. 3. Mix it up. Eat a wide variety of approved foods to keep the diet exciting, using spices and herbs but no salt. 4. Lots of pots and pans aren’t necessary. A simple frying pan and possibly a cookie sheet should suffice. People who are tired don’t have to do too much to make an enjoyable meal. 5. Talk with dietitians about what you like, what your concerns are, and what you don’t understand. Dietitians are always ready to listen and be responsive. 1. Preheat 2 T of butter on medium-low heat. 2. Add zest of one lemon and half the herbs to bread crumbs, save the rest for lemon sauce. 3. Beat egg yolk with 1 T water. 4. Place chicken tenders between two pieces of plastic wrap and pound with small groove side of mallet until thin, but not ripped. 5. Dip chicken in egg wash mixture then in herbed breadcrumb mixture until coated. 6. Place breaded chicken in sauté pan with melted butter only after increasing heat to medium. 7. Cook chicken, approximately 2 to 3 minutes each side. 8. Remove chicken and place on sheet tray to rest. 9. In same pan, add remaining herbs, water, and lemon juice, then heat until simmering. 10. Turn off heat; cube remaining 2 T of chilled butter and add to sauce (stir vigorously). 11. Slice the chicken on the bias. 12. Placed sliced chicken on a plate, pour the sauce over the top, and add garnishes. For an additional tasty option, use the George Foreman grill. Remember to use nonstick release spray on the grill for a sure way to not burn chicken. 1. Thinly slice meat and toss in flour. 2. Slice shallots thin and set aside. 3. If you do not have presliced mushrooms, slice to medium thickness. 4. In medium- or large-sized nonstick pan, heat 2 T of oil on medium-high heat. 5. Loosely but carefully drop sliced meat into pan of heated oil and brown meat lightly, about 5 to 8 minutes. 6. Remove meat from pan and set aside. 7. Add remaining 2 T of oil and sauté mushrooms and shallots for 3 to 5 minutes until translucent and lightly browned. 8. Return meat to pan, sauté meat with mushroom and shallot mixture. 9. Add garlic and onion powder, and stir together for 2 to 3 minutes. 10. Add 1/4 cup of water and stir. 11. Turn off heat and add pepper and sour cream. 13. Pile noodles on a serving platter and top with beef mixture. 14. Top with scallions or chives, and serve. 1. Brown the ground chicken in butter on medium heat along with the seasonings. 2. Fill 2 taco shells for each person with meat mixture, cilantro, scallions, and cheese. Measuring the cheese is the key! It should be 1/8 cup per 2 tacos. Optional Serving Suggestions: Ingredients can also be served in a lettuce wrap, pressed between a flour tortilla to make a quesadilla, or tossed with spaghetti or rice. ** Natural cheese has less sodium and phosphorus than processed cheese.